Ankle pain can lead to other problems as the body tries to compensate for a change in gait. The ankle joint is capable of moving the foot in two primary directions: away from the body (plantar flexion) and toward the body (dorsiflexion). The joint is formed by the meeting of three bones: the end of the tibia (shinbone), the end of the fibula (the small bone in the leg), and the talus (a large bone in the foot). The end of the tibia forms the inner portion of the ankle, and the end of the fibula forms the outer portion of the ankle. The hard, bony knobs on each side of the ankle are called the malleoli. These provide stability to the ankle joint. 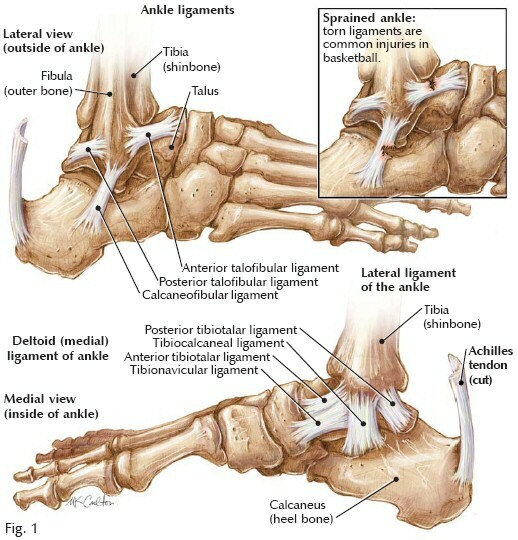 Ligaments on each side of the ankle also provide stability by tightly strapping the outside of the ankle (lateral malleolus) with the lateral collateral ligaments and the inner portion of the ankle (medial malleolus) with the medial collateral ligaments. The ankle joint is surrounded by a fibrous joint capsule. Tendons that attach the large muscles of the leg to the foot wrap around the ankle both from the front and behind. The large tendon of the calf muscle (the Achilles tendon) passes behind the ankle and attaches at the back of the heel. A large tendon of the leg muscle (posterior tibial tendon) passes behind the medial malleolus. The peroneal tendon passes behind the lateral malleolus to attach into the foot. Normally, the ankle has the ability to move the foot, from the neutral right-angle position, to approximately 45 degrees of plantar flexion (up) and to approximately 20 degrees of dorsiflexion (down). Dennis M. Lox, MD, and the Florida Spine Center serve patients within the greater Tampa Bay area, including Clearwater, Tampa and St. Petersburg, as well as all of Florida and the US. You can contact Dr. Lox by calling the office at (727) 462-5582.